The 60,000 square foot facility has 35,500 square feet of meeting and pre-convention exhibit space. There are also six breakout rooms ranging from 350 to 2,650 square feet. Meeting rooms 1 & 2 can be combined to provide 2,650 sf. Meeting rooms 3 & 4 can be combined to provide 700 sf. Extra touches make the 540 sf CrossWinds board room the desired destination for a business meeting of up to twenty people. The adjacent Holiday Inn University Plaza Hotel has three salons ranging from 988 to 2,052 sf (total of over 4,000 sf), and a 504 sf board room. The prefunction areas have a total of 10,200 sf and be set up for registration, exhibit space, and meal functions. The main foyer includes a 18’ x 13’ coat check/storage/work room, 8’ x 13’ ticket room, and registration kiosk equipped with in-house telephone line. The convention center owns an adjacent two acre event parking lot, which can be used for special events. Tented functions, car shows, trailer parking, and other special activities can be held on this lot. 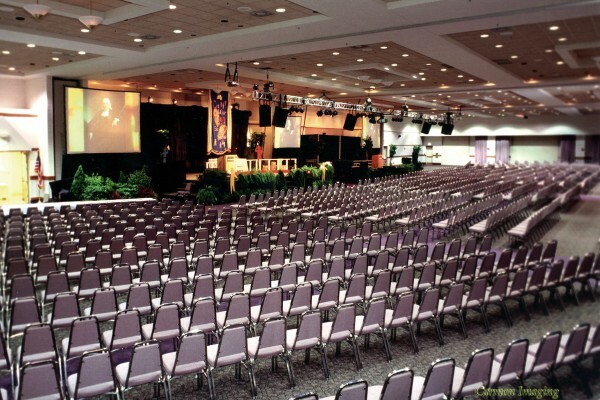 The convention center connects directly to the Holiday Inn University Plaza Hotel that has over 4,500 sf additional meeting space. The Courtyard by Marriott directly across the street has a meeting room with 625 sf. The Hilton Garden Inn across the street has almost 1,600 sf of meeting space. There is no charge for parking at the Sloan Convention Center or any hotel in Bowling Green. Event planners will want to take this into consideration when comparing the cost of holding their event in Bowling Green compared to larger cities. The Sloan Convention Center is all on one level, making it easy to get around. It is connected by a ground level covered walkway to the adjacent Holiday Inn University Plaza Hotel. All parking is ground level as well. The management of the Sloan Convention Center and Holiday Inn University Plaza certify that both locations comply with Title III of the Americans with Disabilities Act (ADA) and its regulations and guidelines. For further information or accommodations please call 270-745-0088. New electronic sign / message board installed on Scottsville Rd.